Tomorrow we are going to my niece and nephew's birthday party. I bought a gift for my nephew a while ago. Can you believe I was actually thinking ahead? (With the way my brain has been working lately, like it's on vacation, that's pretty amazing.) Then yesterday I realized that the party was in two days and I hadn't gotten a gift for my niece. She's three. She'd totally notice. So then I started thinking. What could I get her? Does she really need any more toys? (She's the third girl in the family, probably not. You're welcome, Sonia.) Then I had a brilliant idea. I'd make her something. There is this skirt that I've been eyeing for a while. It looked pretty easy and it was darling so maybe I could do that. Sure, I can do that. I ran to the fabric store and got some fabric and elastic. I washed the fabric last night and ironed the wrinkles out so I'd be ready to go this morning. I had to e-mail my sister-in-law for a few measurements to make the pattern piece and then I was good to go. It was so quick and easy. I ended up making two skirts for my niece and one for Mattey. Here I am hemming. 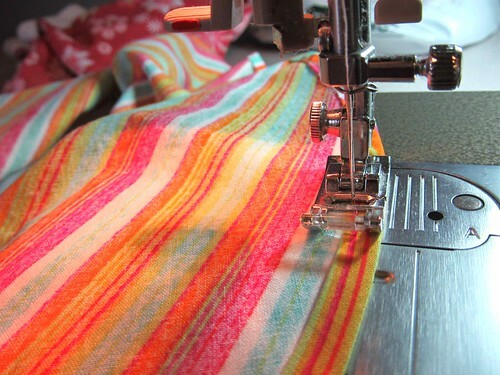 This is the easiest hemming around, unless you have a serger. I need to get one of those. I also made two fabric flower hair clips from this striped fabric and a few beads. They were cute but I forgot to take a picture of them. You'll just have to use your imagination. That skirt looks so cute! What a GREAT present.